I am almost done catching up on late postings. I am busy decorating my new Crafting Hive. I will share photo's as soon as everything is complete. I am so excited. Today's share is another from months ago. The idea came from Holly Krautkremer. Very simple project. 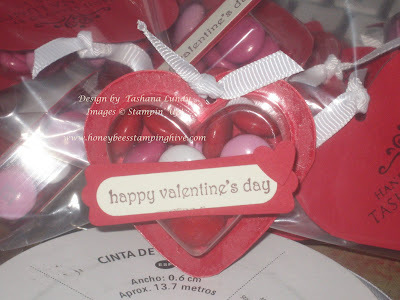 I used Real Red and Very Vanilla card stock along with the Heart Treat Cups, Full Heart Punch, Heart to Heart punch, Word Window and the Modern Label punches. October is a Big Deal!